A picture is worth a thousand words. Or nine lives. Or something like that. The photo accompanaying today's Helen Branswell MetroNews/Canadian Press story regarding H7N9 avian influenza stuck out to me like a sore thumb. Here's the photo. Can you tell what set me off? If you said the cat, you'd be correct. Cats have a history with bird flu. In Indonesia, cats became such a worrisome vector that the government actually ordered the testing of cats. For the story, read my blog from 2007. "In Bangkok, Thailand, all the cats in one household are known to have died of H5N1 in 2004. Tigers and leopards in Thai zoos also died, while in 2007 two cats near an outbreak in poultry and people in Iraq were confirmed to have died of H5N1, as were three German cats that ate wild birds. In Austria cats were infected but remained healthy". Cats in Indonesia were also found to have been infected with H5N1. Variants have been found in a number of domestic cats, leopards and tigers in Thailand, with high lethality. "The Thailand Zoo tiger outbreak killed more than 140 tigers, causing health officials to make the decision to cull all the sick tigers in an effort to stop the zoo from becoming a reservoir for H5N1 influenza. A study of domestic cats showed H5N1 virus infection by ingestion of infected poultry and also by contact with other infected cats (Kuiken et al., 2004)." The initial OIE report reads: "the clinical manifestations began on 11 October 2004 with weakness, lethargy, respiratory distress and high fever (about 41-42 degrees Celsius). There was no response to any antibiotic treatment. Death occurred within three days following the onset of clinical signs with severe pulmonary lesions." 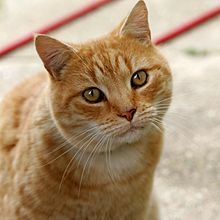 It was announced in the August 2006 CDC EID journal that while literature describing HPAI H5N1 infection in cats had been limited to a subset of clade I viruses; a Qinghai-like virus (they are genetically distinct from other clade II viruses) killed up to five cats and 51 chickens from February 3 to February 5, 2006 in Grd Jotyar (~10 km north of Erbil City, Iraq). Two of the cats were available for examination. Seeing a cat sitting outside an empty stall remined me immediately of these issues. Are the Chinese testing the cats? Are we seeing the death of cats in any significant number? Are the Chinese doing surveillance with veterinarians? Cats eating wild birds is one thing. Cats eating diseased fowl in wet markets is another. Where are we more likely to see this? Dr. Henry Niman may have stumbled onto something interesting. In his Recombinomics commentary of Saturday, he has identified a cash settlement from the hospital treating the first known H7N9 patients. "No one has so far officially informed us of the true cause of his death," Wu said. "It was one of our relatives who told us that the local television had reported that my son-in-law died of a new strain of bird flu." Wu Liangliang, 27, from Yancheng in Jiangsu, was the second man found to have caught H7N9 flu in Shanghai, the city government announced at a press conference on Tuesday, giving only his family name. He arrived in Shanghai in February to visit his parents-in-law and helped Wu Demao, a pork vendor at a wet market on Jinggu Road in Minhang district. Wu Liangliang suffered from high fever in late February and initial treatment by a nearby clinic and the No5 People's Hospital proved unsuccessful. He was admitted on March 1. As we call it in the good ol' U. S. of A.: This is a settlement. Or a payoff. Somehow, the hospital found it necessary to compensate the family for the young man's death. SARS was transmitted to unwitting patients via the HVAC systems in hospitals. This happened in both China and Toronto. Because they were in normal hospitals and not in negative-pressure isolation, the HVAC systems carried the virus to adjacent rooms -- and innocent patients who were there for unrelated reasons. In other cases, SARS virus was carried by the medical personnel themselves, who were unaware that a novel coronavirius was being spread by their own interaction with patients. It appears that the latter may have been the case here. The hospital, with its settlement, is inferring some culpability in the young man's death. It also raises more questions about the route of transmissibility of this virus. We know influenza is transmissible from contact with contaminated solid surfaces. This unique case would seem to indicate that the virus can be spread by more than just inhaling a chicken or a pigeon. The young man was in a wet market, but working pork, not birds (hmmm...). Lord knows, a wet market has lots of opportunity for comtamination. trhat is why the Chinese have, basically, shut down all wet markets and eliminated the poultry and disinfected the markets.